It is important that you read the following booking conditions carefully as they are the basis of your contract with Travel Places. Please read them carefully, detach or print off and keep with your travel documents. (d) References to “arrangements”, “travel arrangements”, “holiday”, “package” or “tour” mean the services we have agreed to provide to or provide you with under your booking with us. 1.3 A contract will exist as soon as we issue a booking confirmation invoice to the party leader. The contract is made in the terms of these booking conditions, which are governed by English law and the jurisdiction of the English Courts. You may choose the law and jurisdiction of Scotland or Northern Ireland if you wish to do so and you are resident in Scotland or Northern Ireland. 1.4 Once you have received your booking confirmation invoice please check this carefully together with your ATOL certificate and all other documents we have sent to you. If any of the information contained within any of these documents is incorrect or incomplete, please notify us immediately in writing as it may not be possible to make later changes to it. We cannot accept any liability if we are not notified of any inaccuracies within 7 days of issue of the booking confirmation invoice to you. 1.6 When you book your tour it may not be possible to confirm your precise air or rail arrangements due to airline and rail operator booking restrictions. Your confirmation invoice and/or ATOL certificate will set out the arrangements reserved for you and/or any provisional reservations or those arrangements we plan to reserve for you. Some airlines charge for luggage separately and some flights may be indirect. These may also be subject to change by your airline or rail operators. 3.1 We provide financial security for tours which include flights, by way of our ATOL (Air Travel Organisers Licence) granted by the Civil Aviation Authority (CAA), CAA House, 49 – 59 Kingsway, London WC2B 6TE. Our ATOL number is 10907. 3.2 When you buy a flight inclusive tour from us you will receive an ATOL certificate from us. This lists the flights, accommodation, car hire and/or other services that are financially protected, where you can get information on what this means for you and who to contact if things go wrong. We, or the suppliers identified on your ATOL certificate, will provide you with the services listed on the ATOL certificate (or a suitable alternative). In some cases where neither we or the supplier are able to do so for reasons of insolvency, an alternative ATOL holder may provide you with the services you have bought or a suitable alternative (at no extra cost to you). You agree to accept that in those circumstances the alternative ATOL holder will perform those obligations and you agree to pay any money outstanding to be paid by you under your contract to that alternative ATOL holder. However, you also agree that in some cases it will not be possible to appoint an alternative ATOL holder, in which case you will be entitled to make a claim under the ATOL scheme (or your credit card issuer, where applicable). 3.3 If we, or the suppliers identified on your ATOL certificate, are unable to provide the services listed (or a suitable alternative, through an alternative ATOL holder or otherwise) for reasons of insolvency, the trustees of the Air Travel Trust may make payment to (or confer a benefit on) you under the ATOL scheme. You must agree that in return for such a payment or benefit you must assign absolutely to those trustees any claims which you have or may have arising out of or relating to the non-provision of the services, including any claim against us, the travel agent (or your credit card issuer where applicable). You also agree that any such claims may be reassigned to another body, if that other body has paid sums you have claimed under the ATOL scheme. 3.5 The price of our flight inclusive arrangements includes the amount of £2.50 per person as part of the ATOL Protection Contribution (APC) we pay to the CAA. This charge is included in our advertised prices. Not all tour or travel services offered and sold by us will be protected by the ATOL scheme. Please ask us to confirm what protection may apply to your booking. 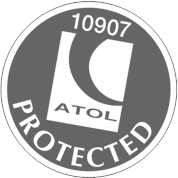 ATOL protection is primarily for customers who book and pay in the United Kingdom. 4.1 We reserve the right to alter the prices of any of the tours shown on our website or in printed brochures. You will be advised of the current price of the tour you wish to book before your contract is confirmed. 4.2 Unless stated otherwise, the price of your tour includes each and all of the component parts described within your booking confirmation invoice. 4.4 When you make your booking you must pay a non-refundable deposit of £50 per person for tours costing £500 per person or less, £100 per person for tours costing between £501 and £999 per person and £200 per person for tours costing £1000 per person or more or such other deposit as may be notified to you at the time of your booking request or full payment if it is within 10 weeks of departure. All prices shown are per person. The balance of the price of your travel arrangements must be paid by the date shown in your booking confirmation invoice which will usually be 10 weeks before your departure date. If the deposit and/or the balance is not paid in time we shall cancel your travel arrangements. If the balance is not paid in time, we shall retain the deposit. 4.5 Changes in the cost of the following mean that the price of your travel arrangement may change after you have booked. However, there will be no change within 20 days of your departure date. • The exchange rates relevant to your tour. 4.6 You may be charged for the amount of any increase in accordance with this clause plus an administration charge of £1.00 per person. However, if this means that you have to pay an increase of more than 8% of the total price of your confirmed tour (excluding any insurance premiums, amendment charges and/or additional services or travel arrangements) you will have the option of (i) accepting the price increase and pay the requested amount (ii) accepting a change to another tour if we are able to offer one (if this is of equivalent or higher quality you will not have to pay more but if it is of lower quality you will be refunded the difference in price) or (iii) cancelling your tour booking and receiving a full refund of all monies paid to us, except for any insurance premiums and any amendment charges and/or additional services or travel arrangements which do not form part of your package. Should you decide to cancel for this reason, you must exercise your right to do so within 14 days of the issue date printed on your final invoice. 4.7 Should the price of your tour go down due to the changes mentioned above, then any refund due will be paid to you. However, please note that travel arrangements that are purchased in local currency and some apparent changes have no impact on the price of your travel due to contractual and other protection in place. 5.5 If you have paid accommodation supplements and the number of people in your accommodation changes you may have to pay extra costs. 5.7 If you have taken out travel insurance it may not be possible to change or cancel this and as such, any premium cannot be refunded. 5.8 Scheduled airlines may not allow name changes within certain periods prior to departure and may not allow these after the flight ticket has been issued. If you wish to make a name change and this is not permitted by your airline, it will be necessary to cancel your flight, lose the money paid in respect of that flight and pay the full cost of another flight, which may not be the same flight or at the same cost as the one you have cancelled. 6.1 If you, or any member of your party, cancel your travel arrangements at any time, written notification from the person who made the booking must be received by us at our registered office or by email to the Tour Manager organising your trip. Since we incur costs in cancelling your travel arrangements, the following cancellation charges will be payable by you. The cancellation charge is a percentage calculated on the basis of the total costs payable by the person cancelling that are not refundable in the event of cancellation. 6.3 For the purposes of this clause, examples of “unavoidable and extraordinary circumstances” include warfare, acts of terrorism, significant risks to human health such as the outbreak of serious disease at the travel destination or natural disasters such as floods, earthquakes or weather conditions which make it impossible to travel safely to your destination. 7.1 Once your booking has been confirmed we will make every effort to provide you with the booked holiday arrangements. Occasionally, it may be necessary to amend or cancel whole or part of your tour. We will notify you of any alteration or cancellation as soon as we reasonably can. 7.2 Independent travel arrangements (eg, flights, airport parking, car hire, etc) that you may arrange separately do not form part of our contract with you. Should we need to make changes to your travel arrangements, we will not be liable for any amendment or any cancellation charges incurred by you in respect of any such independent travel arrangements. 7.3 If, before the start of your tour, we are constrained by circumstances beyond our control to significantly alter any of the main characteristics to your tour, we will offer you the choice of either (a) accepting the changed arrangements (b) accepting an offer for an alternative tour with comparable facilities from us, if available (we will refund you any price difference if the alternative is of a lower value) or (c) cancel your booking completely in which case we will refund you all monies paid by you. Please note that the above options are not available where any change made is a minor one. A significant change may include change of accommodation to that of a lower category and/or price, the change of flight or rail times of more than 12 hours, a change of UK departure location (save the changes between London airports). 9.1 If we are unable to provide a significant proportion of the services that you have booked with us after your departure, we will, where possible, make alternative arrangements for you at no extra charge and if appropriate in all the circumstances we will pay you reasonable compensation. 9.2 Please note that a change in the time of your departure or return flight by 12 hours or less or a change of your UK departure airport between Heathrow, Gatwick, Stansted and Luton and between Manchester and Liverpool are not regarded as significant changes. 9.3 A change of accommodation to an equivalent or higher standard is also not regarded as significant nor are alterations to your itinerary which do not materially affect your tour. Some of the travel arrangements shown on our website can only be operated if there is sufficient demand for the same and a sufficient number of people book these travel packages. If there is insufficient demand on subsequent confirmed bookings, we have the right to cancel the travel arrangements in question. If we have to do so, we will notify you as soon as possible. In this situation, you will then have the choice of accepting an alternative travel arrangement of equivalent or closely similar standard. The cost of any alternative tour offer will be our selling price at the time of change. If the alternative is cheaper, we will refund you the difference. If the alternative is more expensive, you have the option to pay the difference. If you do not wish to take the alternative we offer you, you can choose to cancel your tour and receive a full refund of any monies you have paid to us. We will also consider an appropriate refund of insurance premiums paid, if you can show that you are unable to transfer or re-use your policy. 12.3 We will not accept responsibility for any services which do not form part of your contract with us. These may include any excursion purchased during the course of your tour and any additional services or facilities which we have not agreed to arrange or provide as part of our contract with you. 14.3 You must provide us with full details of any existing medical condition or disability that may affect your travel arrangements (including, in particular, any accommodation requirements) at the time of your booking. If in our reasonable opinion your chosen travel arrangements are not suitable for your medical problem or disability or you are not travelling with someone who can provide all assistance you may reasonably require, we have the right to refuse to accept the booking. If you do not give us full details of your medical problem including all allergies and dietary requirements or disability we can also cancel the booking when we find out full details if in our reasonable opinion, the travel arrangements are not suitable or you are not travelling with someone who can provide all assistance reasonably required. If we cancel your booking as a result of this, the cancellation charges set out in Clause 6.1 above will apply. 16.1 Activities within our tour may require a certain degree of physical fitness. It is your responsibility to ensure that you have the levels of fitness required for any activity you choose to participate in. If you are in any doubt, please consult your GP before departure. We, and those retained by us, to supervise any activities, retain the discretion at any time to decline to allow you to participate in any activity, if we reasonably believe that in the interests of your health, you should not do so. In such circumstances, we shall not be liable for any losses or compensation arising. 16.2 You must provide us with full details of any existing medical or physical problems (including unusual height or weight) or disability that may apply to you or any member of your group and which is likely to affect your ability to take part in some or all of the activities forming part of your tour (including, in particular, any accommodation requirements or difficulties that may be encountered in accessing buildings) at the time of booking. If, in our reasonable opinion, any particular activities or arrangements are not suitable for the medical or physical problems or disability or you are not travelling with someone who can provide all the assistance that may be required, we have the right to refuse to accept the booking or you may not be able to participate in certain activities, in which event we shall not be liable for any losses or compensation arising. 18.1 As part of your booking with us, you are accepting liability for any loss or damage caused by you or any member of your party during the course of your tour. Payment for any loss or damage must be made to us or our supplier at the time that it occurs or as soon as is reasonably practicable thereafter. If the cost of the loss or damage is not known at the time, we will reasonably estimate it and if this reasonable estimate exceeds the amount paid, you must pay the difference once known, and if it is less, the difference will be refunded to you. You will also be responsible for, and agree to indemnify us, in respect of any claim subsequently made against us and all costs incurred by us (including our own and any other party’s full legal costs) arising from your actions. 23.1 In the unlikely event that you have cause to complain during the course of your travel arrangements with us, you must bring it to our attention immediately. If your complaint is not resolved then you must repeat your complaint in writing within 28 days of the end of your travel arrangements with us by writing to us at our Registered Office or emailing us at feedback@travelplaces.co.uk You must provide any booking reference and all other relevant information to enable us to fully investigate your complaint. Any complaints which do not involve death, personal injury or illness and which are not made in accordance with this procedure we are unable to accept liability. 23.2 We are a member of ABTA, membership no. Y6164. Through our membership we can offer you an arbitration scheme for the resolution of disputes arising out of, or in connection with your Tour. Further information on the ABTA Code of Conduct and the arbitration scheme can be found at www.abta.com/consumer-services. 23.3 The arbitration scheme is arranged by ABTA and administered independently by the Centre for Effective Dispute Resolution. It provides a straightforward and inexpensive method of arbitration on documents alone with restricted liability in respect of costs. Full details will be provided on request or can be obtained from the ABTA website. 23.4 The scheme does not apply to claim for an amount greater than £5,000.00 per person and there is a limit of £25,000.00 per booking. It does not apply to claims in respect of physical injury or illness. The scheme can deal with compensation claims which include an element of minor injury or illness, subject to a limit of £1,500.00 per person that can be awarded by the arbitrator. 23.5 The application for arbitration and statement of claim must be received by CEDR Solve within 18 months from the date of return of the holiday. Outside this time limit, arbitration may still be available under the scheme if the company agrees but the ABTA code does not require such agreement. 23.6 For injury and illness claims, you may use the ABTA/CEDR Solve mediation procedure. This is a voluntary scheme and requires us to agree for mediation to go ahead. Details can be provided on request or from www.abta.com. In order to process your booking and to make sure that your tour arrangements run smoothly, we need to pass the information which you provide on to relevant suppliers such as airlines, transfer companies, hotels etc. The information which we provide may also be provided to credit checking companies and public authorities such as customs and immigration if required by law. Where your tour is outside the European Economic Area (ELEA), controls on data protection in your destination country may not be as strong as they are in the UK. However, we will not pass your information on to any person who is not responsible for part of your tour arrangements. If we cannot pass your information on to relevant suppliers, we cannot provide your booking, therefore in making this booking, you consent to your information being passed on to them. Our Privacy Compliance Manager can be contacted on privacy@travelplaces.co.uk You are entitled to a copy of your information held by us and if you would like to see this, please ask us. It may be necessary to make an administration charge for providing this to you. Therefore you will benefit from all EU rights applying to the packages. Travel Places will be fully responsible for the proper performance of the package as a whole. Additionally, as required by law, Travel Places has protection in place to refund your payments and, where transport is included in the package, to ensure your repatriation in the event that it becomes insolvent.